Description: Aqua-blue sleeveless dress with thin pink ribbon band across the middle. 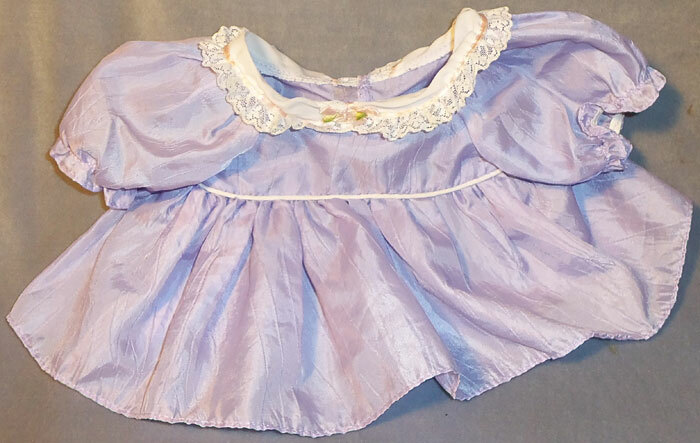 The bottom part of the dress has pink and purple ABC prints with an aqua ruffled edge across the bottom. The back of the dress has a Velcro® brand fastener. The inside of the dress should have a satin tag marked "Puffalump Kids, Fisher-Price, ©1992, 4051, 4052, 4053, 4054". Measures 7" long, 10" wide when laid flat. Description: Aqua-green and white striped sleeveless dress with aqua-green ruffles on the bottom edge and around the chest and shoulder area. The dress has embroidered pink flowers with green leaves in the center of the chest. Description: Blue dress with blue puffy sleeves. She dress has a white scalloped eyelet collar with an embroidered pink flower in the center. The dress has white trim across the chest, and the bottom section of the dress is gathered across the top, but hangs straight down with no trim on the bottom edge of the dress. Description: Pink sleeveless dress with pink and white striped ruffles on the bottom edge and around the chest and shoulder area. The dress has an embroidered pink flower with green leaves and pink ribbon in the center of the chest. The dress has a Velcro® brand fastener on the back and a white sewn-on tag on the inside back marked "Puffalump Kids and 4076-79" in blue. Description: Pink sleeveless dress with a satiny middle section with pastel scribble designs, pink across the chest with a pink flower in the center and two aqua ribbons hanging below the flower. The bottom of the dress has a pink ruffled edge. The back of the dress has a Velcro® brand fastener. The inside of the dress should have a satin tag marked "Puffalump Kids, Fisher-Price, ©1992, 4051, 4052, 4053, 4054". Measures 7" long, 10" wide when laid flat. Description: Pink and white short-sleeve dress with a white upper section and a white sailor's collar. The collar has white lace trim on the edges. The center of the chest has a pink net-type flower with green leaves. The bottom of the dress is pink satin that hangs straight down with two stitched rows across the bottom edge. The back of the dress is open with 2 Velcro® brand fasteners to keep it closed. Description: Pink and white short-sleeve dress with a white upper section and a white sailor's collar. The collar has white lace trim on the edges. The center of the chest has a pink net-type flower with green leaves. The bottom of the dress is pink satin that hangs straight down with two stitched rows across the bottom edge. The back of the dress is stitched closed and DOES NOT have Velcro fasteners. Description: Pinkish-purple short-sleeve dress with a smocked bodice and white lace collar. The sleeves have elastic cuffs with white lace trim on the edges. The white collar has white lace trim on the edges and an embroidered flower in the center. The dress has a smocked bondice (gathered chest area) with white lace trim around the waist. The bottom section of the dress is slightly gathered near the top, but it hangs straight down with no lace nor trim on the bottom edge. Has two Velcro® brand fasteners on the back. Description: Lavender sleeveless dress with white ruffles over the shoulders and across the bottom edge of the dress. The white ruffle is covered with tiny lavender polka-dots. The center of the chest area has a pink embroidered flower with green leaves. Description: Lavender sleeveless sailor-type dress with a pink sailor collar on the chest and over the shoulders with a tied bow in the center of the chest. The bottom section of the dress has pink and aqua heart and star prints with a lavender ruffled edge across the bottom. The back of the dress has a Velcro® brand fastener. The inside of the dress should have a satin tag marked "Puffalump Kids, Fisher-Price, ©1992, 4051, 4052, 4053, 4054". Measures 7" long, 10" wide when laid flat. Description: Purple dress with purple puffy sleeves. The sleeves have elastic around the cuff. The dress has a white collar with lace trim on the edges and a pink ribbon bow in the center. The dress has a thin pink trim across the chest, and the bottom section of the dress is gathered across the top, but hangs straight down with no trim on the bottom edge of the dress. Description: Solid white satiny checkered dress with sleeves. The sleeves and the bottom of the dress are edged in white lace trim. The dress has a wide white lace collar with three pink satin hearts stitched on the front. Description: White sleeveless pinafore dress with a white lace apron and a pink chest area. The pink chest area has white lace trim across the top, and a pink embroidered bow in the center of the chest area. The dress has a white "apron" on the bottom half with eyelit designs. The dress is sleeveless, but it has ruffled lace over the shoulders. Description: Yellow dress with yellow puffy sleeves. The sleeves have elastic around the cuff. She dress has a white scalloped eyelet collar, and a white trim across the chest with an embroidered pink flower in the center. The bottom section of the dress is gathered across the top, but hangs straight down with no trim on the bottom edge of the dress. Description: Yellow and white striped dress with a white sailor's collar. 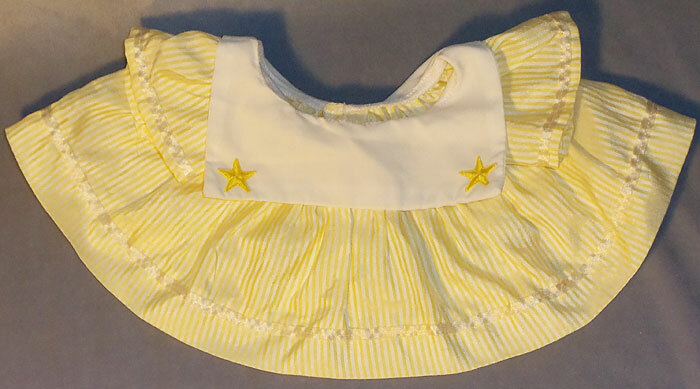 The collar has a yellow embroidered star on the corners. The bottom of the dress has a white silky ribbon about 1 inch above the bottom edge of the dress.